BRASILIA/SAO PAULO (Reuters) - The chances of Brazil's leftist presidential candidate Fernando Haddad narrowing the lead of right-wing front-runner Jair Bolsonaro took a hit when he failed to win a crucial endorsement on Saturday, a day before the two face off in a runoff election. 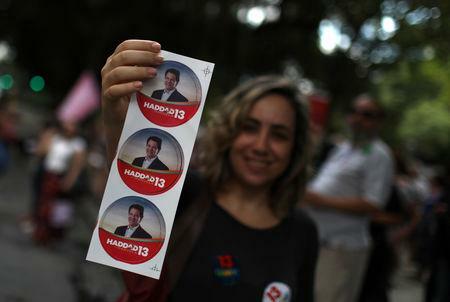 However, polls published late Saturday from Brazil's two biggest surveying firms showed momentum shifting toward Haddad, though he still trails Bolsonaro by a solid margin. Gomes, a former governor of Ceará state in the northeast, is influential in Brazil's poorest region. His endorsement could have given Haddad a big lift in the South American country's most polarized election in a generation. 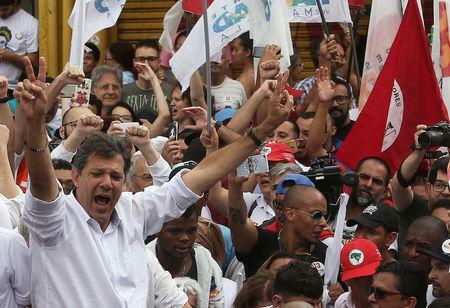 But Rodrigo Janot, Brazil's influential former prosecutor general under whose watch the country's unprecedented investigations and prosecutions of endemic political graft took place, tweeted late Saturday that he would vote for Haddad. That was a blow to Bolsonaro's work positioning himself as the only anti-corruption candidate. "I think we are at the brink of a process that could push our democracy beyond its limits," Janot told Reuters late Saturday. "Freedom, equality and fraternity - always and at any cost." Haddad narrowed Bolsonaro's lead to 8 percentage points in an Ibope poll released late Saturday, a survey that gave him 46 percent compared with Bolsonaro's 54 percent. While Haddad failed to get Gomes to endorse him, he won the backing on Saturday not just of Janot but of Brazil's most popular YouTube host, Felipe Neto, who has 27.7 million followers on his channel. A popular anti-corruption judge, Joaquim Barbosa, who jailed several top PT leaders for corruption, also came out for Haddad. Bolsonaro, a former Army captain, is poised to become Brazil's first far-right president since the end of the 1964-1985 military dictatorship. The 63-year-old seven-term congressman has promised to crack down on crime and corruption, pitching himself as the anti-establishment candidate for voters fed up with political graft and violent crime. 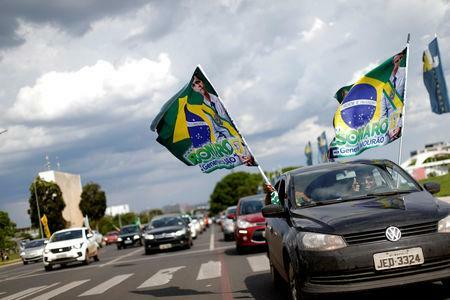 Bolsonaro's sudden rise comes as Brazil finds itself in its worst recession and embroiled in its biggest corruption scandal after the leftist PT ran the government for 13 of the last 15 years. A week ago, Bolsonaro vowed to run all the "red" leftists out of Brazil or put them in jail, harsh words that probably contributed to the narrowing of his lead. YouTuber Neto said he had been neutral until that point. "Everything changed when (Bolsonaro) said he will sweep opponents out of the country or into jail. In 16 years of PT I have been robbed, but never threatened," Neto said by Twitter. In the final two days of campaigning, Bolsonaro has sounded more moderate in his statements, backing down on a plan to follow U.S. President Donald Trump's example and pull Brazil out of the Paris climate change accord. "You are as Brazilian as any of us," he said in a video posted on social media. "I want you to have the right to use your land and exploit its biodiversity and mineral riches." In his final hours of campaigning in Sao Paulo, Haddad accused the Bolsonaro camp of "sweetening" their candidate to make him appear what he is not. "He is a truculent and dangerous person, and that's how he should be presented to the nation," he said.